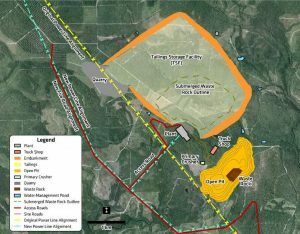 NEW BRUNSWICK – Northcliff Resources of Fredericton, the province of New Brunswick, and the province’s six Maliseet First Nations have entered into an accommodation agreement concerning the development of the Sisson tungsten-molybdenum project. The project, 60 km northwest of Fredericton, is 88.5% owned by Northcliff and 11.5% by Todd Minerals, a subsidiary of a New Zealand company. Proposed site map and infrastructure for the Sisson mine and mill. The agreement will become part of the Canadian Environmental Assessment Agency’s review of the Sisson project. A federal decision is expected in a few months. The project has already been approved by the New Brunswick Department of Environment and local government. A feasibility study for the Sisson project was completed in 2013. It proposed an open pit and 30,000-t/d mineral processing facility to make tungsten and molybdenum concentrates as well as ammonium paratungstate. The deposit has proven and probable reserves of 334.4 million tonnes grading 0.066% tungsten trioxide and 0.021% molybdenum. Detailed information about the Sisson project is available at www.SissonPartnership.com. Why would you train people for the last 4 years if you didn’t know the project was going to go ???? That makes absolutely no sense at all ! There is still no guarantee that this project will be approved , it might be turned down by the environmental assessment study group of the Federal Government. That would be like training people for the next flight to the moon knowing it might never happen ! Where do people apply for a job? How soon will employment take place? Where do you apply for a job….